Congratulations to Smoky Mountain Chapter Member Anne Scott! Anne recently passed the rigorous requirements involved to become a Certified Professional in Learning and Performance (CPLP)! Becoming a CPLP places Anne among an elite community of learning and development professionals world-wide. We are so proud of you! To learn more about the CPLP process and exam, click here. ATD Smoky Mountain is excited to once again offer a prepay option for active members in 2018! Many members took advantage of this savings opportunity in 2017 and we are pleased to once again offer this option to chapter members. Prepays for 2018 meetings/meals are available for $150 (a $24 savings). Payment MUST be received by the February 16, 2018 meeting to take advantage of this offer. The Spring 2017 Chapter Newsletter is now available! Click here to read about upcoming chapter meetings, events, and more! Mr. Edwin Gutierrez, a freshman at The University of Tennessee majoring in Human Resources, is the distinguished recipient of a $1,000.00 scholarship from the ATD Smoky Mountain Chapter. For more information on the Smoky Mountain Chapter’s Scholarship Program, or to make a donation to the Scholarship Program, please click here. ATD Smoky Mountain is excited to once again offer a prepay option for active members in 2017! Many members took advantage of this savings opportunity in 2016 and we are pleased to once again offer this option to chapter members. Prepays for 2017 meetings/meals are available for $150 (a $24 savings). Payment MUST be received by the February 17, 2017 meeting to take advantage of this offer. panelists addressed a series of questions focusing on their experiences both as a leader and with leadership in organizations. Joseph Bunch, Cindy Light, Ron Tredway, and Christopher Giles served as panelists. Cindy Light, Ron Tredway, Christopher Giles, Stacy Myers. ATD Smoky Mountain is excited to offer a prepay option for active members for the 2016 meeting schedule. The cost is $150 - a savings of $24 over paying each month. Payment must be received by the February meeting to participate in this offer. The Second Annual Trainer Throw-Down was held during the December meeting. Four contestants battled for the championship title: Leah Graves, Yvonne Hart, Lucille Gardner, and Felicia Slattery. The topic was Employee Engagement and all participants demonstrated they had what it takes to provide an engaging and interactive presentation. Felicia Slattery utlimately won the title and grand prize, $100 VISA gift card. Thanks to all who participated as a presenter and audience member. Amparo Atencio and Stacy Myers were recognized for their service on the ATD Smoky Mountain Chapter Board by 2016 President Cindy Light. Employee Learning Week will take place December 7-11. Rick Kerner, NAC Chair and ATD Board Member, discusses ELW in this YouTube video. diem. Plainly put, this is development on a shoe-string budget. This is a challenging concept but one that OD professionals have adapted to in the recent past. So, how can you offer development to your entire team (fairness) at the same time (alignment) with minimum financial impact (cost)? Starting a staff book club may be the answer. For several years, I’ve had the pleasure of leading a team of professionals through the development phase of their career with this approach. Depending on the organizational goals of the company as well as the foundational competencies of the team, I compile a list of 4-5 book options and ask the team to vote. The book receiving the most votes wins. Each team member receives a copy along with a prescribed reading schedule for the next 8-12 weeks. 20 minutes is set aside each week for the team members to discuss their reactions, findings and observations to the assignment. At the end of the book, the team chooses one area, either personal or business, in need of improvement and applies a new concept from the book. Each team member then provides updates on their progress for the remainder of the year. Over the years, my team has covered a variety of topics ranging from the algorithms of technology to how love works in corporate America. In turn, I’ve been exposed to concepts and ideas that wouldn’t ordinarily interest me but have certainly broadened my perspective on business and increased my capacity for the unknown. As Plato once said, “Necessity is the mother of invention”. What development tools have you invented during these lean times? The Smoky Mountain Chapter has proudly achieved 100% CORE compliance for 2014! This process involved meeting 18 rigorous requirements from ATD National. The Board voted to move the monthly lunch meeting from Wednesdays to Fridays to provide increased opportunities for trainers to attend the informative meetings. December 2014 -- Local Trainers Respond With a Resounding YES to Annual Trainer Throw-Down! Five trainers competed for bragging rights, and Linda Blocksom of the University of Tennessee won the grand prize, a $100 VISA gift card. The audience voted for the winner based on originality, entertainment, learning value, and engagement. ASTD has a new name: the Association for Talent Development (ATD) to reflect the changes happening in the training and development field. Stay tuned for more news on what the future holds! The ASTD Smoky Mountain Chapter is pleased to announce that Amparo Atencio and Ron Tredway have earned the CPLP credential from the American Society for Training & Development (ASTD) Certification Institute. Earning the credential mean Amparo and Ron possess the knowledge and skills to be top performers in the training and development field. 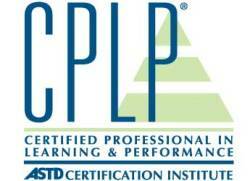 Becoming a CPLP enhances a professional’s reputation by recognizing that they have an overall understanding of the nine areas of expertise for training and development, as defined by the ASTD Competency Model™, and can apply this knowledge in the workplace. The Charlotte Area ASTD Chapter invites area chapters to their Day of Learning Conference on Wednesday, December 4. It will be a full day of learning from terrific speakers, opportunities to participate in skill building workshops, and interesting panel discussions. Breakfast, lunch, and a social hour are included in the price of registration. September 2013 -- The Chapter Board was recognized by ASTD National with its September 2013 Chapter of the Month award and a $500 cash prize, as part of the Sharing Our Success (SOS) program. In a letter to the Chapter, Tony Bingham, ASTD President, remarked, "Since the program’s inception in 2003, ASTD chapter leaders have benefited from the shared knowledge and ongoing learning that the SOS program provides. The Chapter of the Month award is this program’s highest honor." Gale Mote, chair of the Chapter Recognition Committee that awards the Chapter of the Month honor, said, "This prestigious award recognizes the ASTD Smoky Mountain Chapter for demonstrating innovative and unique approaches in providing great value to their members and workplace learning professionals in the community." The series kicks off with a demonstration on effective coaching by our own Yvonne Hart, VP of Administration, on June 19! In July, Regal Entertainment Group is hosting a site visit of its training facility. In August, we will host a webinar as we hear from our own Anne Scott, current Board President, on engaging virtual learners. It promises to be a summer full of informational and educational programs. See details of the programs, and come join us! December 2012 -- The Chapter entered into an agreement with Tusculum College to provide opportunities for students who are enrolled in the Master of Arts in Education – Human Resource Development program and studying at the Knoxville Campus of Tusculum College. An annual gift of financial support will be awarded to deserving student(s) of the college with high financial need, who have shown academic promise, and have expressed a commitment to being active and involved in the field of training and development. Heather Patchett, Vice President for Institutional Advancement at Tusculum College, accepted a $1,000 check from 2012 Chapter President, Bryon Ownby, during a Chapter board meeting. May 2012 -- The Chapter was recognized for development of its Wild Apricot membership management tool submission to the ASTD "Sharing Our Success" (SOS) program. The national SOS program identifies best practices among local ASTD chapters and uses them as models for other chapters. Sara Jeffcoat, Chair of ASTD's Chapter Recognition Committee said, "This recognition honors the Smoky Mountain Chapter's best practice that demonstrates its commitment to managing a successful organization as well as advancing the learning and development profession at the local level. We are excited to honor the chapter with ASTD's SOS recognition." December 2011 -- Dr. Cynthia Solomon, Tusculum College, was honored for her 25-year career in higher education when the Chapter awarded the 2012 scholarship to a deserving student in Dr. Solomon's name. She stated, "I cannot say thank you loudly enough for your decision to fund this scholarship for a Tusculum College HRD graduate student. As my daughter said, students will be benefiting from my academic career even after I retire...one of these years!"